There’s a picture of my little sister, bearing down on her bike, elbows up and face thrust forward over the handlebars with a gleam in her eye, a 5-year old conquering the road. That’s kind of how she flew through her short life. 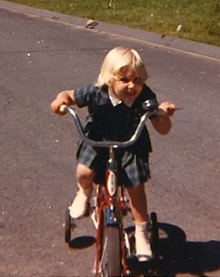 Susan had a certain innate fearlessness that allowed her to blaze paths that were troubling to an older brother. She learned to ride that bike before I ever did. In home movies, there’s Susan launching herself off the diving board with brio, before they cut to a cringing David who shamefully climbs down, without dampening so much as a toe. Susan’s joie de vivre bubbled to the surface. She was always the first person to dig into the holiday decorations, the one most excited for a party, the girl with the smile who could always stir things up, make things more exciting and fun. I remember her laughter, great gulping peals of laughter, the kind that would render her helpless and spent on the floor. She had a sparkle that drew others in and made them want to be near her. Susan had her impish side. She volunteered to be the official scorer for the county wrestling championships that I competed in, and when my opponent beat me for the title, Susan couldn’t resist putting several stars near my name on the draw sheet that goes to the winner. I’m sure that guy had to be a tad curious why this Lloyd’s name had a halo of stars hovering above it across the poster. Perhaps a small case of civil disobedience but it felt like loyalty to me. This is no storybook. Susan was not all light and sunshine, particularly after she got cancer. She could be short with a clumsy nurse trying to find a vein. She was harder on friends and family, and she had no time for those who whined about life’s trivial problems. Susan had sharper edges when she was sick, but she needed them to fight cancer. I guess we always knew she was strong, but the grit she showed during those 13 months amazed us all. She fought with everything she had, and it was noble and brave and eye-opening. Was that really my little sister on that hospital bed, challenging the doctors, bearing the pain, steeling her resolve? She never lost her selflessness, the stuff that made her Susan. After finishing my first final exams at college just before Chistmas, I got a ride home with a friend, and walked into a dark house. I went up to my room, and there on the pillow was a note from Susan explaining that she was back at Mass General having chest surgery to remove another tumor. She hadn’t wanted me to be distracted by this, so she insisted no one say a word about it until I got home. Susan got out of a hospital bed, a day earlier than was recommended, and literally fell over the front doorstep and into the house on Christmas Eve, determined not to let the cancer rob her of what would be her last Christmas. There was no quit in her. She did her schoolwork thanks to tutoring from her teachers. She went back to work at a local movie theater. She applied to colleges. She graduated from high school. Life was moving on. Susan insisted that the cancer was gone that summer, and she convinced us of it. In a strange twist the bleaker things looked, the more we looked to Susan to reassure us that things would be alright. I still look to her. The gifts she left me in that last year are everywhere. She gave me the blueprint for how to deal with the inevitable trials that life brings, and often when I’m feeling down there’s a remnant of Susan in me that brings me out of it. She taught me about compassion and informed me with perspective. Thirty years later her life still shapes my own.